Récemment rénové! maison idéale loin à Munich. Profitez de Munich comme un local dans cet hôtel récemment rénové appartement de deux pièces dans le centre de la ville. Le bâtiment date du milieu des années 1800 et les commodités à partir de 2016. Avec 82 mètres carrés (près de 900 pieds carrés), vous aurez beaucoup d'espace pour travailler ou se détendre. L'appartement est au rez-de-chaussée et, en plus d'être très sûr, est facilement accessible pour tous les voyageurs. L'emplacement est très proche de SENDLINGER TOR, un important centre de transport en commun avec l'intersection de 4 lignes de métro, 4 lignes de tramway et une ligne de bus. Vous pouvez facilement aller partout dans la ville de Sendlinger Tor. Marienplatz est seulement à une courte distance. En dépit d'être dans le centre de la ville, l'appartement est très calme et est toujours apprécié par les clients de tout âge. Familles, retraités, les voyageurs d'affaires, chanteurs d'opéra, des acteurs et des explorateurs de toutes sortes ont été nos invités au fil des ans. La salle de bains a été entièrement rénové en 2016 et comprend une grande douche de plain-pied, chauffage au sol, armoires sur mesure et un combo Lave-linge / sèche-linge. La cuisine comprend un grand réfrigérateur, lave-vaisselle, beaucoup d'ustensiles de cuisine, ainsi que des pots-et-casseroles de toutes tailles. L'appartement est idéal pour les longs séjours ou courts trajets get-away. Une nouvelle marque, fabrication italienne canapé-lit avec un matelas de taille supplémentaire pour le confort se trouve dans la salle de séjour avec une belle nouvelle table à manger et des chaises. Le salon dispose d'un éclairage de bon goût qui peut être grisée pour répondre à toute humeur. La chambre a une nouvelle marque 180cm x 200cm matelas et lit avec literie de qualité supérieure de Zoeppritz, la plus ancienne société de tissage de tissu de l'Europe (1828). Vous aurez beaucoup d'espace de rangement, d'un bureau de travail confortable et la connectivité WiFi haut débit et, bien sûr, d'une télévision à écran plat. Dessinez les rideaux belles JAB ANSTOETZ de la vie privée à tout moment et profiter de votre maison loin de la maison à Munich. La salle de bain a été rénové à un prix égal à une belle voiture. tuiles naturelles de pierre sur le sol et les murs, planchers chauffants, miroir de maquillage éclairé, sèche-cheveux et beaucoup de stockage pour des articles de toilette. Excellent location here with a short walk to the main shopping streets and the first of many historical sites in Munich. Good supermarkets close by and lots of hot water were handy for us and our 18 year old twins. Easy to use washing machine and oven let us get some washing done and cook a few meals at home. We would definitely book again. 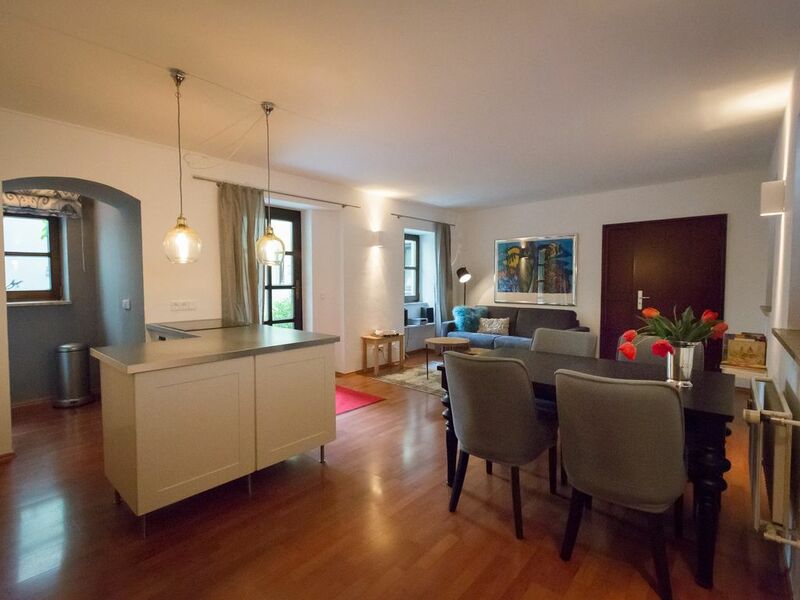 This is a lovely apartment in a great location, with the Sendlinger Tor Ubahn stop only 5 minutes walk. We stayed here over Christmas with our two sons, ages 17 and 21. They slept on the fold out couch, which was OK. A little tight for two big guys. The bed in the master bedroom was very comfortable. The kitchen is fairly well equipped. We made Christmas dinner in the apartment and had most of what we needed in terms of kitchen utensils. There are 2 nice grocery stores within a block or two. The clothes washer was handy seeing as we packed very light for a 10-day Europe trip. If you’re interested in renting this apartment, you should know that it is on street level. Half of the windows are located on a locked courtyard and the others are on the street. We opened the inner windows on the courtyard every day to relieve the moisture and it felt very safe. For the most part, it was very quiet at night. We never met Patt Howard, who is listed as the contact. We communicated with a young man by the name of Harald. He was helpful, but it did sometimes take him a while to respond. We did not have any problems during our stay, but we know that Harald left town to visit relatives over the weekend and it was not clear as to who we would contact if we were to say lock ourselves out or have an issue with plumbing or heating. A little more info from the managers of the property would have been helpful. We’ve stayed in a lot of Airbnb’s and VRBO’s over the years and we’ve come to expect very clear and prompt communication. We were frustrated by the multiple emails that stated a different person was going to check us in (first Harald, then his sister, then his neighbor and then Harald). Also, he was not able to get the apartment cleaned until 7:30pm. He did let us drop our luggage before the check in time though, which was helpful. The communication for this particular rental was a little bit frustrating at times, but it worked out. It’s a lovely apartment. It worked fine for us for 3 nights. Four people was a bit tight and we really appreciated them allowing us to bring our 2 sons, as it’s listed as a 2-person apartment. We were having a hard time finding a place big enough in Munich over the holidays. I would recommend this apartment for 2 people. This apartment is located on the ground floor. It was clean and close to all attractions. It had all the amenities which included a wash/dryer. The home owner was easy to work with and responsive to any inquiries we had. We stayed in December and enjoyed all the Christmas festivities it was easy the walk to all the Christmas Markets and historic sites. Classic style and descriptive directions for how to work oven/washing machine/trash/etc making it easy to stay. It was a lovely apartment and would highly recommend! The apartment was in a great location. We could walk everywhere. Many trains located near by. There's a cool whiskey bar right outside the door, too! Wonderful apartment in excellent location! Very nice, spacious apartment in excellent location, close to transit, walking distance to Marienplatz. Quiet, with many restaurants, bars, and a great beer garden nearby. We will likely stay here again on our next trip to Munich! Should you need to cancel your stay, any payments made may be used towards a future booking. If you wish to have a refund instead and we are able to rent the dates you had booked, we will refund all payments less a 150 Euro administration fee. We always recommend international travellers to take out a trip insurance policy should the unexpected occur.